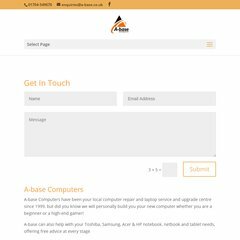 Topics: A-base Pcs, Parts, Repairs/services, Broadband, and Directions. It is hosted by Internetnamesforbusiness.com Florida, using Apache web server. It has 4 nameservers, including dns104.c.register.com, dns082.d.register.com, and dns244.b.register.com. Its local IP address is 209.235.144.9.